It turns out an Old Fashioned doesn’t have to be whiskey-based. Some have rum, cognac and more. Try these five great varieties to get you through the winter. Around here, the Old Fashioned is the drink of choice during these cold, damp days. These boozy sippers pop up more during happy hour now than any other season. An Old Fashioned doesn’t require much. It’s bourbon or rye with sugar, bitters and ice, though you might see it tweaked with a different spirit and fancied up with another name. Cognac Old Fashioneds are big this year. So is mixing two base spirits. Below are five great takes on the classic drink I’ve sampled in recent weeks. The R and R Old Fashioned at Damn the Weather. This tipple takes two different spirits — Dickel rye and Plantation Dark rum — that share similar profiles, holiday baking spices such as clove and allspice. The black tea and raisin notes from the rum lend this old fashioned a subtle but exotic tweak. A spicy, buttery drink. Truffled Old Fashioned at Canon. This is Canon’s signature Christmas drink, a holiday favorite for the anti-eggnoggers. Barman Jamie Boudreau used to work at a restaurant that kept leftover truffles in a bottle of Armagnac to preserve the expensive nibs. 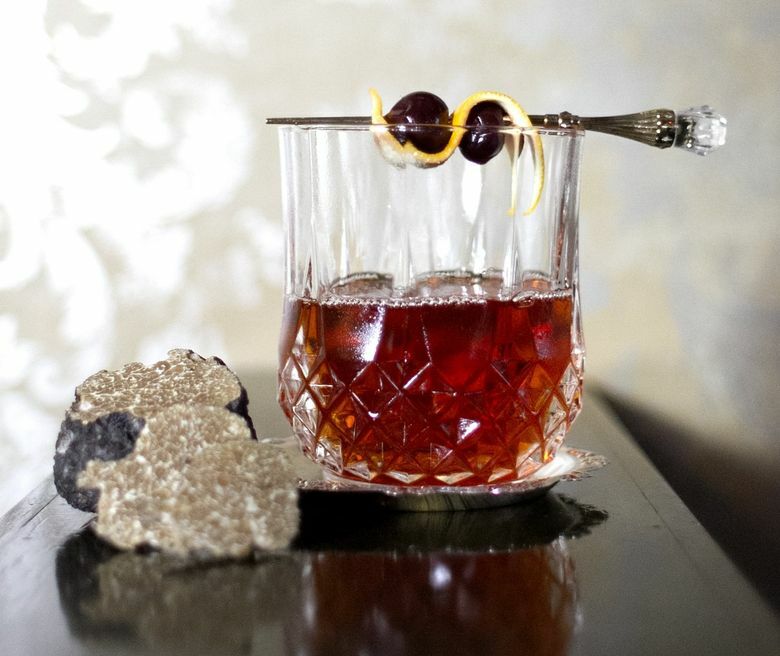 He had a light-bulb moment: infuse black truffles with cognac for an old fashioned. Boudreau structures the drink with subtle vanilla, cacao and coffee notes (from tonka-bean syrup and Boker’s bitters). Pineapple Old Fashioned at Ocho. Despite what you might think, this isn’t some light, tropical take. Instead of simple syrup, this Ballard bar uses the dessert wine Pedro Ximenez sherry to give the drink a Spanish tweak. The rich sweetness masks the potent punch of the Plantation OFTD overproof rum, a blend of Barbados, Guyana and Jamaica rum. The pineapple note likely comes from the Jamaica rum. The resulting old fashioned has a big, chocolate finish. The orange bitters is a nice touch. This is what Anthony Bourdain should have tried when he visited Ocho to film his show. Gabriela’s Old Fashioned at Navy Strength. One of the more creative spirits pairings, this blend of cachaça and rye brims with zest, vanilla and coconut from a mix of orange oil, pandan, toasted coconut syrup, Angostura bitters and lemon and lime peels. It tastes like a spiked Thai dessert. Toki Old Fashioned at Kokkaku. All around town, bartenders concoct all sorts of complicated cocktails to showcase the Japanese whiskey Toki, an affordable alternative to the pricey Yamazaki and Hibiki. One of the best takes is one of the simplest; Toki’s citrusy and honey notes are accentuated with Kokuto, a brown sugar from Japan’s Okinawa region, along with bitters.